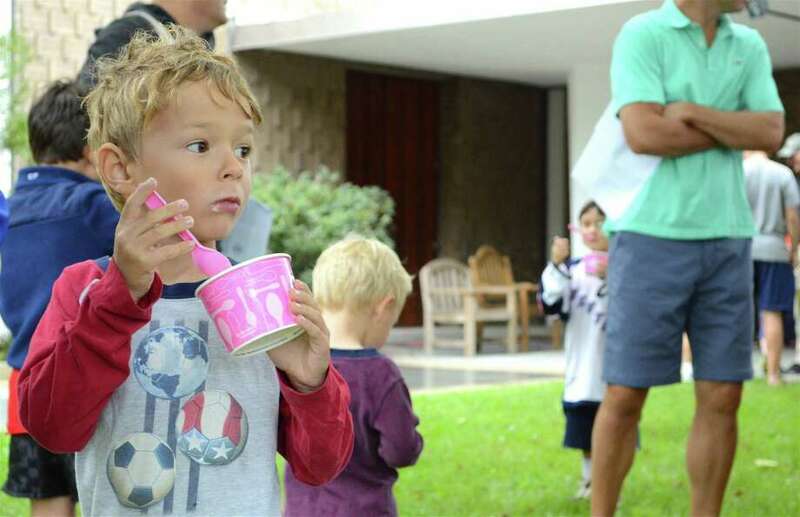 Brian Ikard, 6, of New Canaan, gets his first taste of scouting at the annual ice cream social hosted by Cub Scout Troop 70, Saturday, Sept. 8, 2018, at St. Mark's Episcopal Church in New Canaan, Conn.
NEW CANAAN — With games, dessert, and a bit of rain, Cub Scout Pack 70 welcomed some new recruits into the fold Saturday afternoon at its annual ice cream social at St. Mark’s Episcopal Church. It was a fun time, where parents got information on scouting and young kids played games and learned some of the first tenets of the program from the older ones. For the first time this year girls are also being encouraged to join, with a few already signed up to participate in town. Prostor said a meeting is scheduled at the Church of Latter-Day Saints the evening of Sept. 17 for parents and kids to learn more about the new policies and how all kids are now welcome to participate in scouting.